Hello again, garden enthusiasts, how is your summer going? It is getting a bit dicey out there, with the current lack of rainfall. As I drive the neighborhoods from the Tappan Zee Bridge in Rockland County, NY to Springfield NJ, checking on clients, I am seeing more and more burnt out and sleeping lawns daily. Please observe your local watering guidelines for irrigation systems. More info in my article: Water 101. 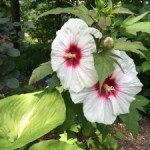 As the Colorful Collectable Day Lilies wane in their bloom life, one of my favorite Perennial plants comes to life, and says “look at me!” In the worst heat of the summer, Moscheudos Hibiscus is such an incredible performer, and creates such a profusion of flowers, they always please the eye. 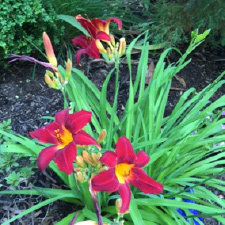 I like to use them where other perennials would normally burn up in the sun, and like to give them plenty of room, (about 3’-4’wide) for spread. 6’ center spacing gives them plenty of room to breathe. The colors that these plants come in are usually in the white to red range, with fantastic hues of wonderful complimentary colors, and I like to use them as color inspiration in my garden designs. Make sure that you place them in the rear of your garden beds, as they tend to get tall. Is the heat of the summer getting to you? This brings me to the tangent of wilt. Now is the time of year that we all experience wilt in some form or another. The more common wilt that we encounter is plain old dry wilt, due to the direct sun, wind, and temperature. I like to place saucers under my many habitants of the Patio, to help them hydrate during the day, after their morning watering. 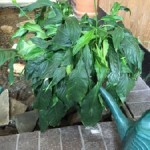 Heat wilt can happen to plants in the sunniest locations, and usually affects the varieties of impatiens; there are many newer hybrids that command a lot of water. Hibiscus in containers can wilt somewhat readily also. What to look out for? Bagworm. (See photo). Our old adversary Bagworm is showing up again here in Bergen County on Arbor Vitae. 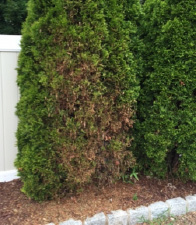 Keep an eye on your Junipers, also because these two types of plants are extremely vulnerable. These critters can move quickly, so take action right away to combat them. Your local garden shop advice guru can help you with control. For myself, I like to get to them early, and cut them off. Enjoy these last weeks of summer everyone! Stay cool and happy gardening. Everett Fink is a Certified Rutgers Master Gardener, Certified Pesticide applicator, and N.J. State licensed Home Improvement Contractor. 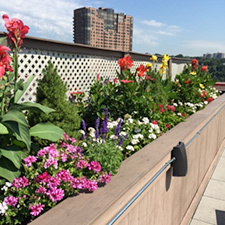 Everett was designated Top Tier Designer at Sponzilli Landscape, and currently Owns Property Details LLC, in New Jersey. This entry was posted in Garden State Green. Bookmark the permalink.